This is our second litter and they were born the 22:nd of November 2003. As all our litters the names of the kittens are taken from the Eurovision Song Contest (ESC)! These kittens are named after their fathers homecountry, Finland. The father is a very handsome boy, FIN*Mirandos Brand New Day, "Brandon". He was born in Finland and we are very proud that Isolde could meet such a wonderful boy. 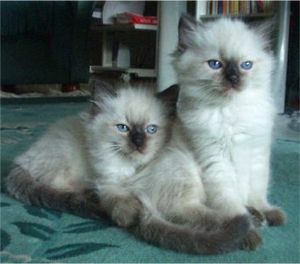 Actually he has very old lines in his pedigree with both Raggedy Ann ragdolls ( 10 in five generations) and Blossom Time ragdolls (8 in five generations) The kittens are both seal colourpoints. The girl is named "La Dolce Vita" [Finland 1989] and the boy "Addicted To You" [Finland 2002].